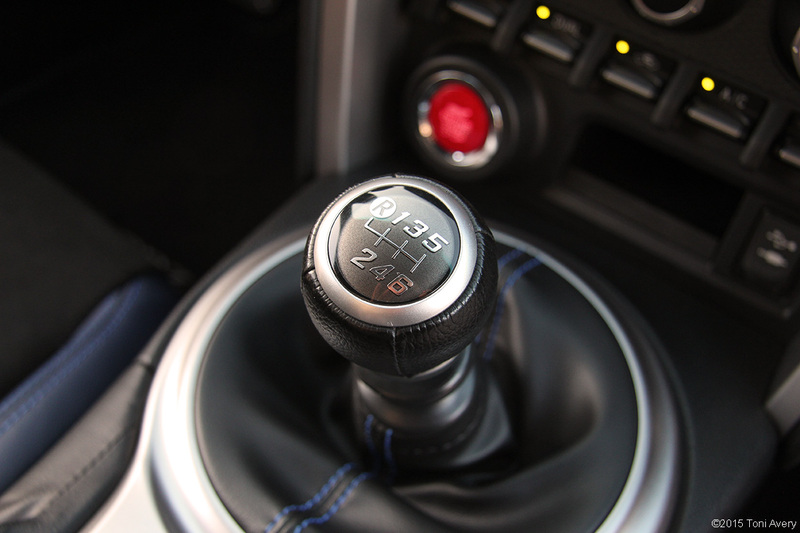 In the ever-shrinking yet ever-popular affordable manual transmission Sports Car market, the Subaru BRZ offers so much more than a reasonable sticker price. It’s a car with an exterior geared towards youthful buyers looking to stand out. It’s also practical, allowing those track day enthusiasts to fit four tires in the rear (with the rear seats folded down) for some serious rubber burning without the worry of being stranded on bald tires. It’s an incredibly well-balanced car with enough performance to keep even the most serious speed demons satisfied. 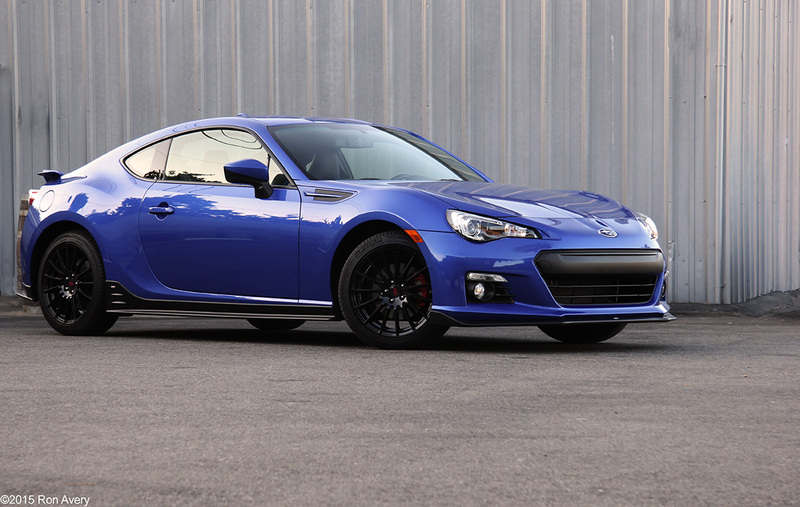 This BRZ is equipped with a 2.0 L flat-four Boxer engine producing 200 HP and 151 lb-ft of torque mated to a 6-speed manual transmission. Immediate thoughts when getting behind the wheel of the BRZ was that it didn’t feel as quick as I expected. On my usual canyon route, it felt sluggish getting up to speed. But the more I drove it, the more I wound the car up through the gears and got so much more from it. It’s not one of those low-end instant torque cars that just flies with the slightest touch of the throttle. Quite the opposite, it really requires the driver to wind up through each gear in order to get the most out of the car. The transmission feel is positive. 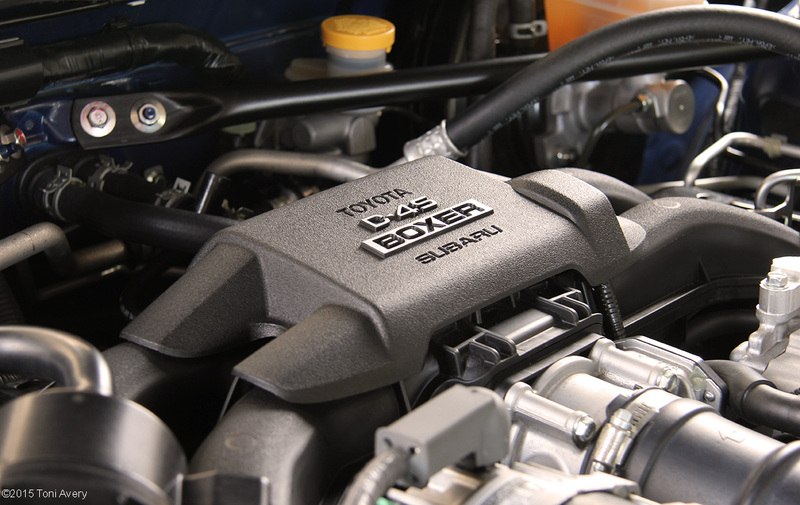 It utilizes well spaced gear ratios that complement the BRZ’s torque curve. Right below the gearshift is a button called VSC Sport. This isn’t your typical sport mode with changes to the throttle response, for example, rather this mode focuses on adjusting traction to afford the driver more maneuverability. Sound is another big difference to other similarly prices Sports Coupes. 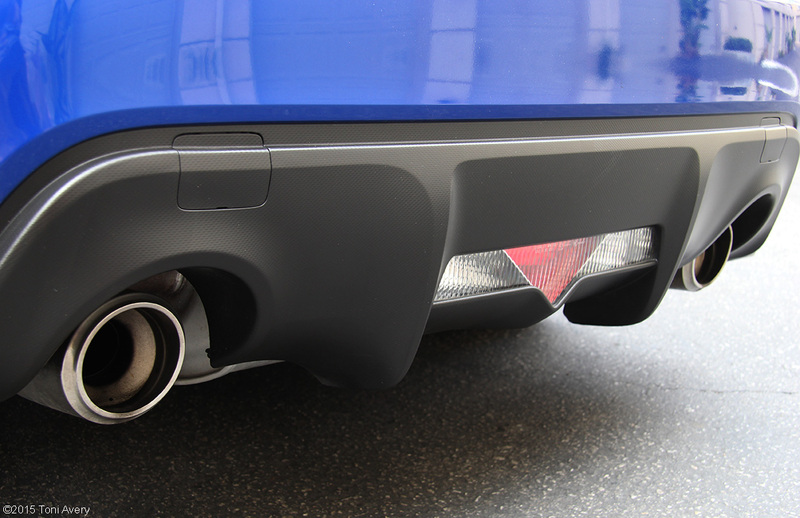 The BRZs exhaust note is almost non-existent from the inside with the motor being the loudest, most prominent noise you hear. This took some getting used to. It’s a very loud and mechanical sound affording the driver the ability to hear almost every gearshift. From the outside, the exhaust note is nice but really not loud enough for someone who enjoys an aggressive sound. 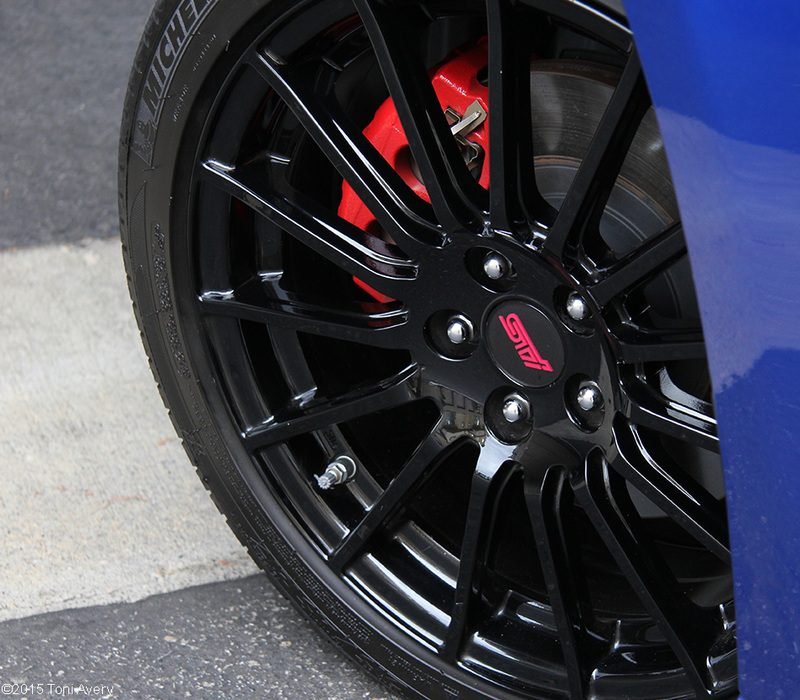 The brakes on the BRZ also took some getting used to. Testing so many cars, it’s sometimes challenging to go from one to another and know what normal braking feel should be. The standard braking system featured across all BRZs, is an Anti-lock Braking System with Electronic Brake-force Distribution. Towards the end of my week with the car I became accustomed to the braking power. My initial thoughts on them being soft were changed with more time behind the wheel. 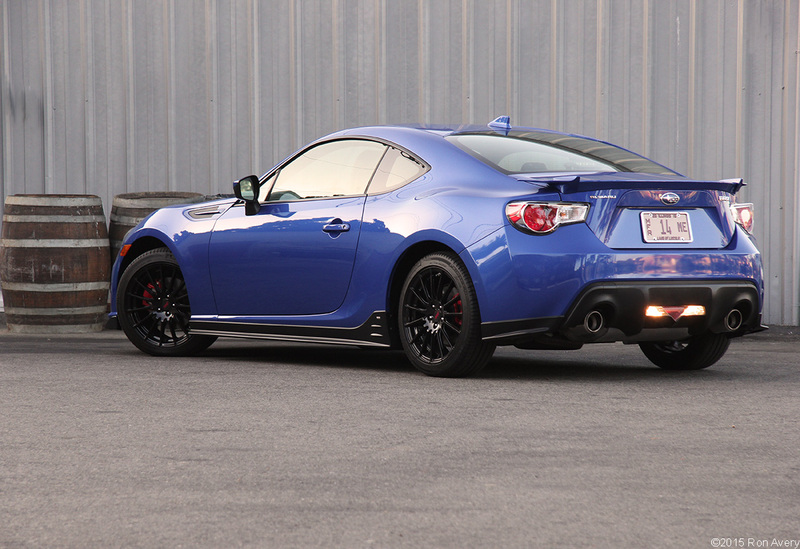 On the outside, this BRZ is finished in WR Blue Pearl paint (500 of the 1000 Series.Blue cars produced). The Series.Blue edition adds STI front, side and rear black accents, 17-inch STI black alloy wheels and red-painted brake calipers. I absolutely love the exterior design of this car. It’s both sporty and aggressive with an incredibly low, planted stance. From the drivers perspective it’s a brilliant design move to allow the front fender humps to be raised just in eye line of the driver for help with parking and maneuvering the low front end. And the front is so low thanks to the unique Boxer engines low center of gravity, not just helping in a more creative design but also in handling and performance. The 17-inch black alloy wheels are one of my favorite parts on the car and its subtle rear wing adds a bit of aerodynamic edge. It’s one of the best looking cars for around 30K currently on the market. 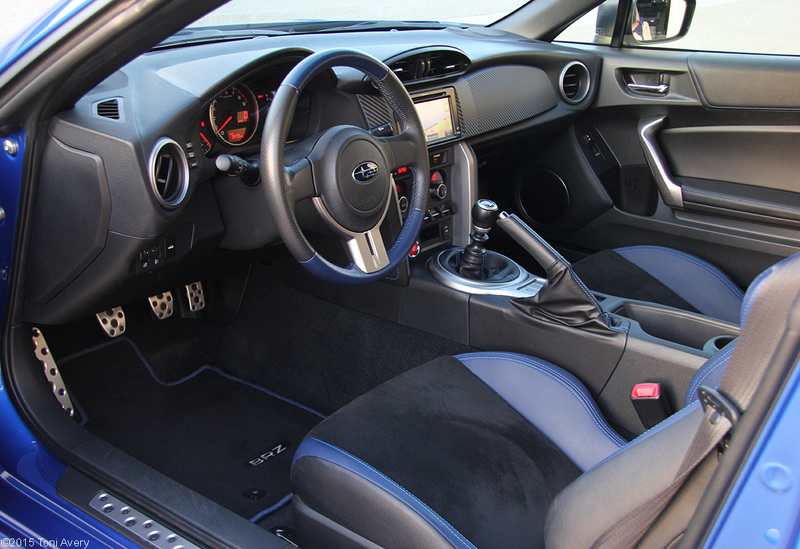 Inside this BRZ is a navigation system, VSC Sport mode button, heated front seats, fold-down rear seats, Series.Blue specific accents including blue leather, Alcantara and stitching throughout, and carbon fiber accents, plus app/iphone integration. 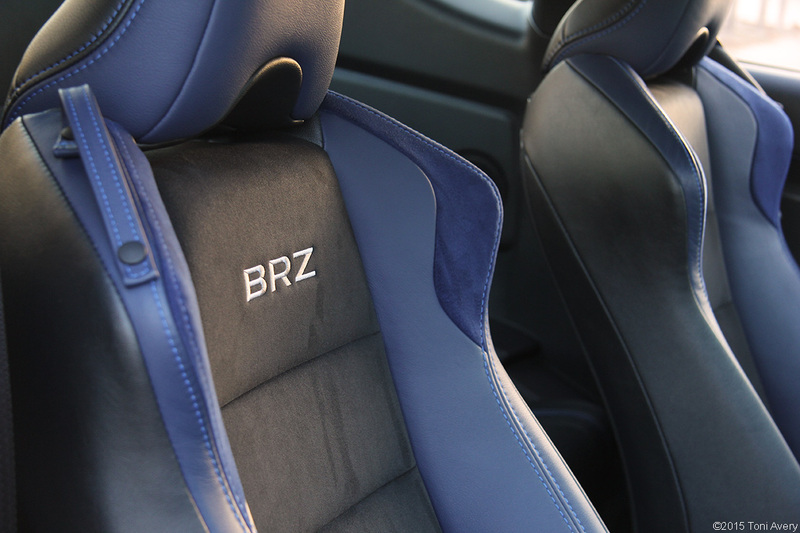 Immediately when you take a seat in the BRZ you feel as though you are in a much more expensive car. The seats are possibly the best feature inside with blue Alcantara, leather and stitching as well as black Alcantara inserts. These are great seats for track work and look as good as they feel. 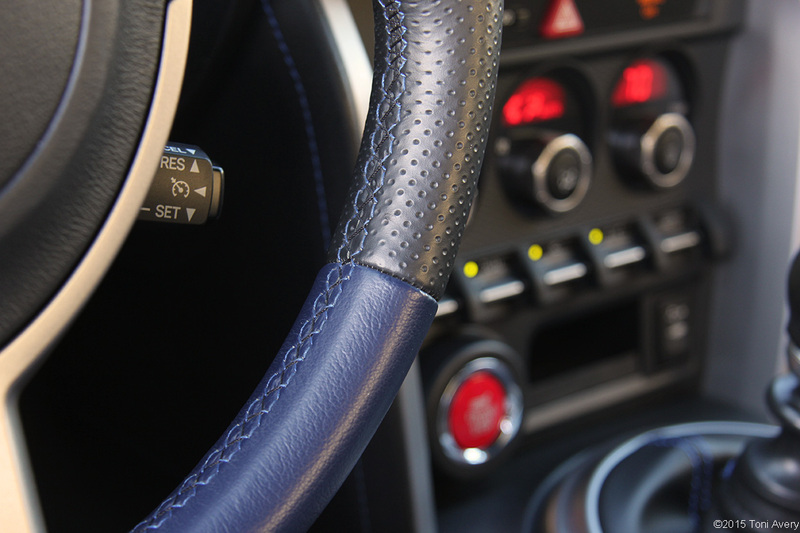 The blue stitching and leather throughout the interior gives it a more sophisticated and sporty feel. And speaking of track work, not only is there plenty of standard trunk space, but the rear seats do fold down to offer enough room for four tires. My favorite tech feature was the Aha app. Plug your smart phone into the USB port and you will be prompted to download an app called Aha. It’s similar to Pandora and plays directly through the cars infotainment system and speakers. 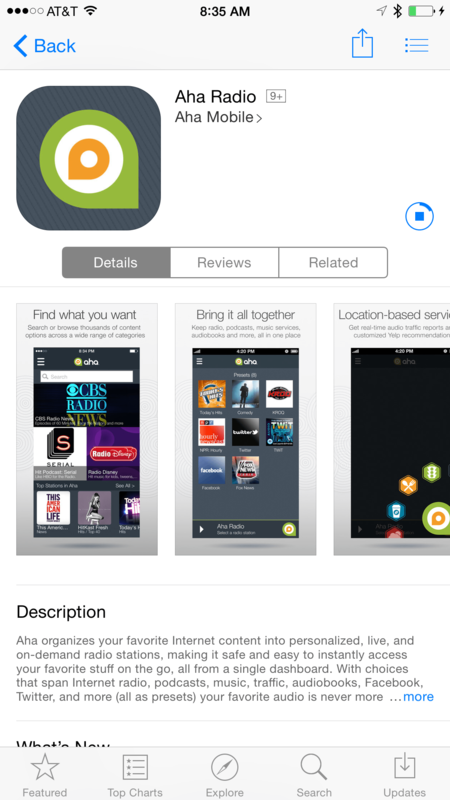 The sound quality is better through the app than listening to standard radio. I really enjoyed using this app while driving the BRZ. The only catch was the placement of my phone while plugged it. It’s directly behind the shifter and can get in the way especially with a larger phone. A small net or pouch on the side of the console would solve this problem easily. When shopping for a 25-30k Sports Car with exceptional handling and driver enjoyment, two obvious choices are the BRZ and the Mazda Miata. Owning a 2013 Miata I love everything about it, even the terribly placed cup holders and lack of standard Bluetooth. But that’s not what these cars are about. You want to get in and smile all the way to your destination. Both these cars will provide that for you, but this one has something the other doesn’t (among other things), practicality and storage space. Especially for those diehard track day junkies.